Our last protagonist belongs not to two worlds, but to three: the worlds of Renaissance Italy, post-Byzantine Greece and Muscovite Russia. The Russians have long regarded the monk Maximos, who came to Moscow from Mount Athos in 1518 and lived in Russia until, his death 38 years later, and whom they call Maksim Grek (the Greek), as a major figure in the history of their culture; even though they profited little from his learning and, as we shall see, treated him with revolting cruelty. In an epoch-making book, published in Louvain in 1943, Elie Denissoff proved conclusively that Maximos was none other than Michael Trivolis, a Greek expatriate who frequented the humanist schools of Italy in the late fifteenth century(44). It is not often that the biography of a major historical figure is so unexpectedly enlarged by a scholarly discovery; and Denissoff could claim with justice that, thanks to his book, the Life of Maximos the Greek assumed the shape of a diptych, of which Mount Athos was the hinge, and Italy and Muscovite Russia were the two leaves. The Trivolai were a distinguished Byzantine family, with Palaeologan connections. One branch had settled in Mistra. Michael was born in Arta about 1470. Twenty years later we find him in Corfu, where he stood for election to the Governing Council. The results must have been wounding to his pride: 20 votes were cast for him, 73 against(45). It was probably in 1492 that he moved to Florence, where his vocation as a scholar was strengthened and directed by the teaching of John Lascaris and Marsilio Ficino. The influence of Plato and of the Florentine "Platonic Academy" were to remain with him, for better or for worse, all his life. Another, very different, influence was experienced by Michael Trivolis during those early years in Florence: that of the Dominican preacher Savonarola. Its full impact was to come later, after Savonarola's execution in 1498; yet well before then we seem able to detect in Michael's temperament a tension between the two basic propensities of his life — the humanist and the ascetic. The next phase of Michael's life in Italy took him in 1496 to Venice, where he worked for Aldus Manutius, who had just embarked on his great edition of the Greek authors, and two years later into the service of another distinguished Hellenist, Gianfrancesco Pico della Mirandola. In 1502, after a religious conversion whose causes remain hidden from us, he entered the Dominican order and became a monk in the monastery of San Marco in Florence. It is worth noting that this was the very monastery of which Savonarola had been the prior. Many years later Michael described to the Russians in great detail the life and organisation of the Dominican Order, while carefully concealing the fact that he had belonged to it himself(49). His secret was to remain undiscovered for more than four centuries. Michael Trivolis' career as a Dominican was brief. By 1506 we find him, now as the monk Maximos, in the Monastery of Vatopedi on Mount Athos, back in the Church of his fathers. We know little of his life at that time. What is clear is that, despite a strong aversion to the idiorrhythmic life then prevalent on Athos, he came to regard the Holy Mountain as his true spiritual home. It was in 1516 that the last and longest period of Maximos' life began. In that year an embassy from the Muscovite ruler, Basil III, arrived on Mount Athos. Its purpose was to find and invite to Moscow a competent translator. The Russian Church, from its birth in the tenth century and until the mid-fifteenth, had been directly subordinated to the Patriarchate of Constantinople; and during this period the royal library, relegated to the cellars of the Moscow Kremlin, had been enriched by a large number of Greek manuscripts brought from Byzantium. By the early sixteenth century few if any Russians were capable of reading them. There was need of an expert to decipher them and to translate them into Slavonic. The choice of Maximos for this task was by no means obvious. He held no ecclesiastical office beyond that of a simple monk, and he knew no Russian. Yet his reputation as a scholar must have weighed in his favour. On his journey north he spent nine months cooling his heels in Constantinople. There can be little doubt that the Patriarchate took this opportunity to brief him on the two vital issues which then dominated its relations with Russia: the wish to restore its authority over the Russian Church, which had lapsed in the mid-fifteenth century; and the hope of obtaining from Muscovy aid, material or political, for the Greek Orthodox subjects of the Sultan. Maxim (as we may now call him, using the Russian form of his name) arrived in Moscow in March 1518. His first task was to prepare a translation of patristic commentaries on the Psalter. As he still knew little Russian, he had to translate from Greek into Latin, which his Russian collaborators then rendered into Slavonic. This extraordinarily cumbersome procedure could hardly fail to lead to errors of translation: for these Maxim was later to pay dearly. Before leaving Mount Athos, Maxim had secured from the Russians a promise that, his task completed, he would be allowed to go home. However, the Muscovite authorities seemed in no hurry to honour their obligation. Meanwhile, through his close contacts with local personalities, Maxim was becoming dangerously involved in public controversy. The first half of the sixteenth century was a period of great ferment in Muscovy: educated Russians seemed to be locked in endless and passionate debate. They had indeed much to argue about: whether the sovereign was omnipotent, or should share his power with the aristocracy; whether heretics should be burnt at the stake; what was the role of monasticism in contemporary society; and what was the right relationship between church and state. One of these issues requires brief examination here, for it had a lasting effect on Maxim's fate. During the late Middle Ages two different types of rnonasticism were prevalent in Russia. On the one hand, we find, mainly in the central areas, the large coenobitic house, owning land, often on a considerable scale, exploiting peasant labour, practising works of charity and immersed in administrative and economic activity. This type of monastery was known as "Josephian", after the name of Joseph, abbot of Volokolamsk and an influential figure at the turn of the fifteenth century. On the other hand, in the Far North, groups of small hermitages, known as Iavrai in Greek and skity in Russian, clustered round clearings in the forest. Their monks came increasingly to believe that landowning was incompatible with the monastic estate. It was in these remote skity that the contemplative tradition burned with a brighter flame; and the leaders of this movement, known as the "Elders from beyond the Volga", became the spokesmen in late medieval Russia of the mystical teaching of Byzantine hesychasm(50). When Maxim came to Russia the "Josephian" party was on the ascendant, though the problem of monastic estates remained a burning issue. It is hardly surprising that Maxim, with his experience of Athonite monasticism, sided with the "Non-Possessors", as the opponents of monastic estates were also called. With what seems to have been a certain lack of tact or caution, he allowed his Moscow cell to be used as a kind of dissident salon where critics of Muscovite society gathered to air their grievances. This, in sixteenth century Russia, was asking for trouble. In 1525 Maxim was arrested and tried by an ecclesiastical court presided over by his arch-enemy, Metropolitan Daniel of Moscow. The charges against him included holding heretical views, slandering the Grand Prince of Moscow, having treasonable relations with the Turkish Sultan, claiming that the Russian Church's independence from the patriarchate was illegal, and denouncing the monasteries and the church for possessing land and peasants. The charge of heresy, based on no more than grammatical errors in his translations, was false and absurd; so also—as we now know from material recently discovered in the Soviet Union—was the allegation of treason(51). The last two charges, relating to the uncanonical status of the Russian Church and to monastic estates, were presumably true. After a grossly biased trial Maxim was sentenced to solitary confinement in the Volokolamsk Monastery (the bastion of the "Possessors"), was put in chains and allowed neither books nor writing materials. His imprisonment was to last for 23 years. In 1531 he was tried again, largely, it seems, because of his refusal to confess to the earlier charges, and was sentenced to imprisonment in another monastery. Gradually the harshness of his treatment diminished, especially after his chief tormentor, the Metropolitan Daniel, was removed from office in 1539, and the Patriarchs of Constantinople and Alexandria wrote soon afterwards to Ivan IV, requesting his release. Maxim repeatedly begged his jailors to let him return to Mount Athos. The stony-hearted Russian authorities refused all his requests to be allowed to go home, at least once on the grounds that he knew too much about their country. (52) During the last few years of Maxim's life his torments came to an end. 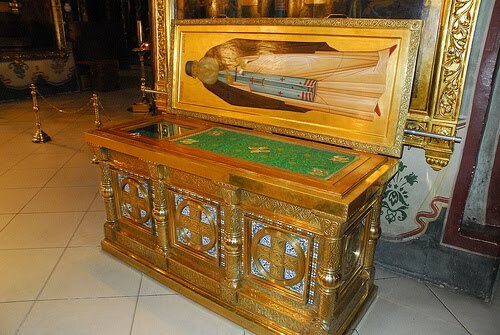 He was allowed to reside in the Trinity Monastery of St.Sergius near Moscow (in what is today Zagorsk), where he spent his time teaching, writing and reading. Despite his fading eyesight, he taught a fellow monk enough Greek to enable him to copy out the Psalter in that language, and wrote to his chief persecutor, the Metropolitan Daniel, consoling him on his fall from power and offering him complete forgiveness. He died in the Trinity Monastery in 1556, at the age of almost ninety. The posthumous fate of Maxim the Greek in Russia was a curious one. His opinions on many matters of vital concern to Russian society were too much at variance with official policy to make him fully acceptable, at least in the next few generations. It is true that the wonderful patience with which he endured 23 years of cruel torments caused him to be venerated as a martyr, especially by those Russians who were in opposition to the official church. He had moreover, in his lifetime, a small circle of Russian admirers, some of whom were men of outstanding calibre. It is perhaps surprising to find among them the Tsar Ivan the Terrible. But Maxim's influence in Russia was always very limited. It is remarkable that this Byzantine scholar was long revered for his statements on the sign of the cross, while his references to Greek classical literature were largely ignored(53). It is only in this very restricted sense, I believe, that we can legitimately speak of Maxim as ὁ πρῶτος φωτιστὴς τῶν 'Ρώσων, to quote the subtitle of Papamichael's Greek biography of him(54). Other scholars have pointed out that there is something symbolic in Maxim's Russian destiny. The rejection of a man who, in his spiritual life and in the depth of his scholarship, typified what was best in the culture of post-Byzantine Greece, marked in a real sense Russia's turning away from her ancient heritage of Byzantium(55). It is true that, at the very time he was in Muscovy, the Russian churchmen were developing their egregious theory of Moscow the Third Rome, which ascribed to their capital city the role of focus of universal power and centre of the true Orthodox faith. But Maxim was too much of a Byzantine at heart to be taken in by this meretricious substitute of the Byzantine oecumenical idea, propounded in Russia by his sworn adversaries, the "Josephian" monks. He could not fail to observe how, in sixteenth-century Russia, through the narrowing of spiritual horizons and in the wake of the Realpolitik of its rulers, the Christian universalism of Byzantium was being transformed and distorted within the narrower framework of Muscovite nationalism. Perhaps this is why Maxim's vision of the Christian commonwealth is, in the last resort, pessimistic. In a passage of pointed allegory he tells us that, toiling one day down a hard and wearisome road, he encountered a woman dressed in black, sitting by the roadside and weaping disconsolately. Around her were wild animals, lions and bears, wolves and foxes. "The road", she said to Maxim, "is desolate and prefigures this last and accursed age". Her name, she told him, was Vasileia(56). Source: From Dimitri Obolensky's "The Byzantine Impact on Eastern Europe" in The Byzantine Inheritance of Eastern Europe, London 1982.